What does the owlbear say? So, Ivan already went nova and posted about our recent Warzone matchup. Figured I’d jump in and give my own impressions of the game and what we’re planning to do in the future. I’m also going to ramble on about the design of this site and how I want to change it. First up is the fun gaming stuff. I have to say that I had a lot of fun playing Warzone. Ivan did a great job showing me the ropes and even though our terrain setup was very ghetto and ad-hoc it still added a lot to the game. I was coming into this with very limited wargame experience: I’d played a few matches of other games and a bunch of D&D Minis back in the day. I’m not exactly a newbie to the whole thing but I’m not an old grognard, either. For me this game hit a really, really sweet spot. I had a wonderfully good time. I loved troop deployment and the simplicity of the system. We were using the old 1st edition rules and I was surprised at how fluid and useful they were. Everyone is rolled on a d20 and the mechanics were simple (roll under target number). I felt like it was a good mix of player skill, luck, and good models. So far it’s probably my favorite wargame system I’ve played. Our setup and the miniatures that we used were very much ad-hoc. Ivan had a box of miniatures and we just tossed ’em on the table with some blocks of carving foam I keep intending to turn into actual terrain. It was a little tough keeping track of exactly who was what but we did all right. Didn’t turn me off and it showed me that if you really just want to wargame you can make do with paper togs and some soda cans. You don’t have to spend money if you don’t want to do so. But I want to spend the money. I’m kind the stereotypical “poor artist” of our bunch, but I still really enjoy my hobby. Seeing those sad little unpainted guys on the table just instilled in me the burning desire to assemble and paint a really wicked looking army. Playing with unpainted guys is just bad mojo in my book, plus it’s a betrayal of my artistic integrity. After all, its the perfect melding of my artistic and nerdy tendencies. Even beyond the armies is the terrain. This is where I really start to get excited. I took a lot of sculpture classes (I can still throw a good pot on the wheel) and I love working in mixed media. Wargame terrain is like the ultimate in nerdy mixed media. You take a block of foam, some old bits and bobs from SCRAP and then paint it all to look like some old building. I’ve been meaning to do some terrain building and I think that Warzone might be the kick in the pants I need. Now that I know we’ll be playing some more Warzone I think it’s time I started looking into building a good general purpose army. After a lot of talk and some research I’ve decided to use the Imperial Guard from Warhammer 40K as my Capitol army stand-ins. Cadian Army Shock Troops will be representing my light infantry and regular grunts. I like the sculpts and the price is definitely right. Plus plastic figures are really easy to model. Catachan Jungle Fighters will stand in for some of the more special armies. Namely the Sea Lions, Desert Scorpions, and maybe even Free Marines. Again, they’re plastic and cheap on the budget. The real wallet killer is gonna be the Kasrkin Squad standing in for my Free Marines and Heavy Infantry. The sculpts are utterly awesome but I think I’ll be asking Santa for a generous gift this year. Those will be my base guys. Eventually I plan to add in a few command squads (both Cadian and Kasrkin), a few snipers, and maybe even some Jungle demolition experts. Though in the beginning I’m just going to start with the Cadian Shock Troops and the Catachan Jungle Fighters. I figure early on the jungle fighters will work for light infantry and the Cadian’s can play heavy infantry. The rest I’ll figure out as a I go along. So, the site is really red, huh? While I like the clean simplicity I’ve simply grown tired of the look I have going on. Part of my long periods of silence has been me trying to figure out a new look. I’m finally getting close to something I really like and I hope to have a new look for the new year. I probably won’t get it up right at the new year, but by the end of January I should have something that’s less rage and hunger inducing. I hope. Warzone: Playing the Capitol Army. Capitol does not have quite the range of units that Imperial or the Legion boasts, but they have a lot of interesting tricks available. The key benefit over other armies is rapid deployment. A lot of the Capitol units have unique deployment methods, whether it is infiltration (free marines and desert scorpions), parachute insertion (rangers) or the helicopter deployment that all units can utilize. Each of these have some measure of risk involved but it means it is very hard to keep a Capitol player away from where he wants to go. This is combined with rapid moving units, such as their light vehicles and Martian Banshees and you have a quite mobile force on your hands. The main weakness of Capitol forces tends to be that their lack hard hitting close combat troops. While they have some, like the Sunset Strikers, close combat tends to be more of a backup plan, than deliberate policy for Capitol. As such, some units like Sea Lions and free marines carry Punisher blades for backup. Examine carefully if the situation warrants a close assault, but be carefull as you may easily get overpowered by an opposition better equipped and prepared for it. Equipment wise, Capitol equipment is generally solid, combining decent damage, range and accuracy. Don’t neglect the general armoury for additional weaponry, particularly for heavy damage output. An army is led by great men, and there’s a fair share of options. Uniquely, only a few of the Capitol hero models require their respective squads to be fielded, thus you can easily have, say, a Free Marine hero even if your squads are all basic infantry. This gives some good flexibility, and lets you bolster your force easily. None of the Capitol hero models are single man death machines but you have a lot of flexibility. There’s no less than four personality models available, each of which lends unique options as well. While the use of personalities should be a rare thing, they give you some fun options and can really raise the oomph of your force. Back in high school, Warzone, the Mutant Chronicles wargame, left a big mark on us. It was the first game to show us a different way of doing things compared to the Games Workshop stuff. So today, we had 2 games of Warzone, one Bauhaus vs Capitol and one three way battle with the Dark Legion. Flamethrowers are wicked (very high damage, no attack roll, can roast an entire squad). Large dark legion creatures that are strong enough not to need to brace their weapons are deadly. There really never was a superior squad turn sequence to the Warzone one. Everything just feels so fluid and natural: Everyone takes their actions, one trooper moving, aiming then firing while another is “rock n roll” with his MG for 3 actions. Even big beefy heroes can be brought down by a determined volley of rifle fire. Very cheap entry cost. 12-14 models for a 500 point army. Maybe twice that for 1000 points. An initial investment of 30 dollars or less. Welcome to the warzone maggots. Hope you survive! Here’s a picture of our ghetto terrain setup. This is what happens when you don't have fancy terrain. A long time ago, there was only wargames. Then people starting experimenting with things, and we got results like the Braunstein games, and eventually Dungeons and Dragons. Through the years games have straddled the lines. Examples of wargames with RPG elements include Inquisitor and many of the offerings from twohourwargames (Nuts, 5150, Chain reaction etc). 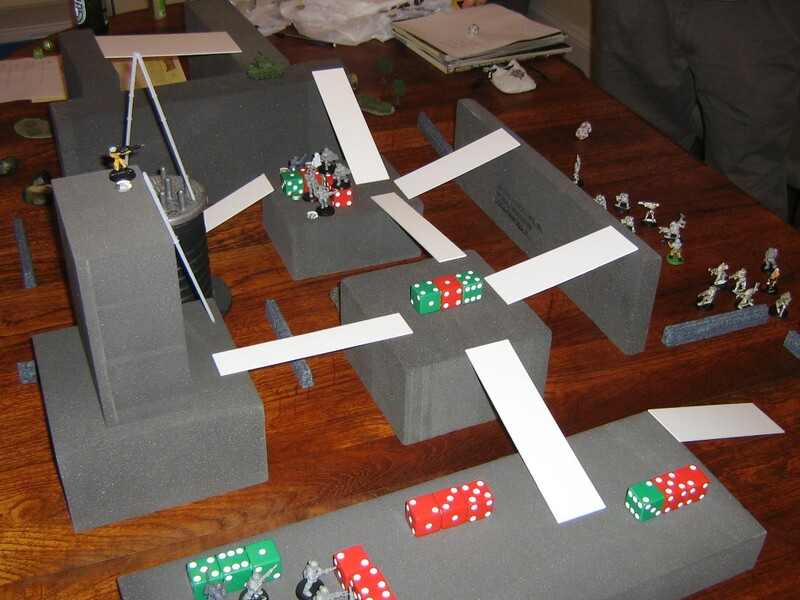 Examples of RPG’s with wargame elements are most strongly represented by D&D and Warhammer FRP. For our current roleplaying campaign, I tossed around a lot of ideas, and my initial thought was to use a wargame set to run a roleplaying campaign. We’d have rules for the tabletop combat, and then just roleplay through the “talky talky” scenes. In the end, we settled on GURPS, since it has a very strong tactical combat aspect, but if we run a large battle, we may switch the mechanics to resolve that. In the upcoming session, the two players are respectively the sergeant and corporal of a French infantry squad near the Franco-German border in 1940. They’ve been sent on a routine patrol to check out a bridge in the area, where they’ll be attacked by a German patrol. The interesting part will be that this will be run using GURPS rules, but with miniatures and terrain set up (if a bit primitive looking, as I only have so much time to prepare), and conducted as a tactical battle, in the vein of a proper wargame. The players will have to issue orders to their subordinates (8 squad members in this case), and may have to endure those orders being misunderstood or not carried out, based on morale and leadership tests. All aspects traditional of a wargame. Simultaneously, they will be able to act independently, come up with ideas and implement them, and act “outside the box” in the manner of an RPG. Nothing about this is truly new, it’s existed for years, but I think the core of it, is something that is too often overlooked in roleplaying games. Plenty of games use miniatures and tactical movement, but they often omit the things that wargames have done for years: Opportunity fire, morale, the uncertainty of whether orders are carried out, the importance of leadership. We have to go back to Megatraveller before we see those things making an appearance and that’s been how long? A: Swords and spears don’t interest me, rifles and tanks do. B: D&D has good tactical combat in the sense that it’s fun and is pretty much a game in itself. But it doesn’t have plausible tactical combat. When I play, I want to think about whether I can place my machine gun in enfilade, whether my men will be able to hold the line, whether my ambush will work, NOT whether I am placed in the right square to get a +2, or how these three powers will interact with each other. And that is where we can turn to wargames, to find solutions to those problems. Whatever happens, it’ll be interesting to see how they deal with the situation, and how they react to the fog of war of not knowing where the enemy is, until they are actually observed on the table.